Every name on my baseball cards mattered. I said every name out loud or whispered it or mouthed it, trying it out, feeling its weight on my tongue. But among all these names, Biff Pocoroba ruled. It was a particularly satisfying and even addictive name to say, so I said it a lot, and it ended up traveling with me through life, far beyond the years when I collected cards. I was a teenager high on bong hits and throwing a Frisbee and the name would come into my head: Biff Pocoroba. I was in my twenties slouching behind the counter at the liquor store where I worked and the name would come into my head: Biff Pocoroba. I was in my thirties, proofreading in my cubicle, and the name would come into my head: Biff Pocoroba. I’m in my forties, and here I am again, thinking about Biff Pocoroba. If I grow to be an old man, I’m sure the words Biff Pocoroba will continue bubbling up into my consciousness long after most other things of the darkening world have shucked off their names. According to one particularly influential source, God created everything, but he let the first human handle the creation of words: “So out of the ground the Lord God formed every beast of the field and every bird of the air, and brought them to the man to see what he would call them; and whatever the man called every living creature, that was its name.” (Genesis 3:19) This naming separated that first human from everything else in creation, the namer from the named, and also separated the first human from infinity, namelessless, eternity, God. A few lines later in the familiar story quoted above, this mortal separation really gets cooking, and the first guy gets the heave ho from Eden, his intimate connection to the holy world severed. Long story short, humankind then proceeded to suffer and sin and beget and grieve and murder and roam, all along using and creating and developing the names of the world, relentlessly, as if the cause of the first separation from pure holiness could be a way—maybe through commandments, maybe through psalms, maybe through prayers—to somehow return to holiness. I never really connected the name Biff Pocoroba with anything in particular beyond the vague recollection that Biff Pocoroba was a Brave, and that he was, like Bruce Bochte with Bruce Bochy, Garry Maddox with Gary Matthews, and John Montefusco with John D’Acquisto, paired up forever in my mind with Bob Apodaca. But from this point on I may associate him with this 1978 card, which subtly draws the viewer into the charged moment of a big league game as well as any card I’ve seen. It has something to do with Biff Pocoroba’s rugged looks, and his tough ready-for-action squint, and his beaten-up turned-around cap and thin, snug chest protector, and the way his chunky mitt catches the sun, but the intimate sensual pull of the card is centered most on the way Biff Pocoroba is tugging upward, almost gently, on the straps of his mask. He is about to pull that mask on and go to work, and the photo freezing him in the moment just before he does so puts us right there, anticipating the way the mask would feel if we were to pull it onto our own face and look out at the whole field in front of us. Biff Pocoroba, in name and in this card in particular, is a way for me to enter the moment—as holy a moment as I can imagine—of a major league game. Biff Pocoroba’s name must have been announced during the introductions of players before the 1978 All-Star Game. 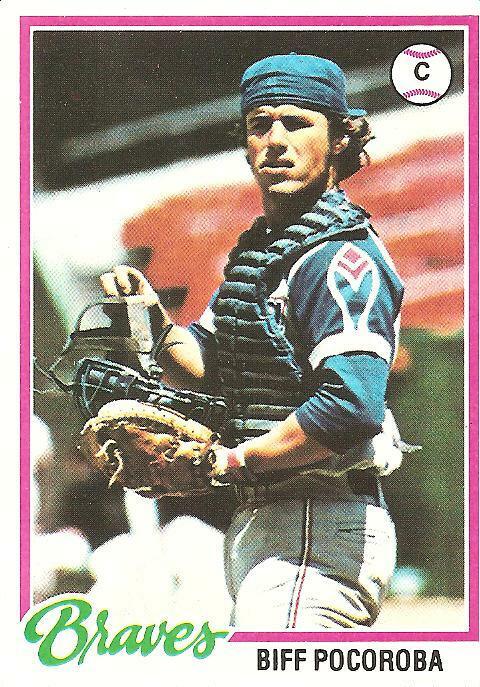 It was part of the one good month for the 1978 Atlanta Braves, both their sole winning month of the season and the month that saw them send three players to the All-Star game: their star slugger, Jeff Burroughs, their ace, Phil Niekro, and Biff Pocoroba. Biff Pocoroba? Yes, Biff Pocoroba. He’d had a strong 1977 campaign (highlighted by his .290 batting average) and carried the reputation for being a stellar defensive catcher (as attested to on the back of this card: “Biff once threw out 11 consecutive runners attempting to steal”). He probably had a certain glow about him, too, because he was young, just 25, and so the sky could still seem to be the limit. It’s not so hard to imagine Tommy Lasorda, the NL manager that year, scanning the Sunday batting averages as he tried to pull together his list of reserves and reacting positively to the name Biff Pocoraba. He was batting .262 at the All-Star break, a decent enough number for a catcher, especially if you are imagining a cannon arm and many years of better things to come. Of course, there weren’t many years of better things to come. Biff Pocoroba finished 1978 batting .242 and, hampered by injuries, was never a regular in the big leagues again. But by the time he started receding into obscurity, his name had already imprinted itself as something nearly holy to many of us American boys of long ago who will be saying Biff Pocoroba until the maker calls us back into the realm beyond names. You are currently browsing the archives for the Biff Pocoroba category.